This is part eight of my discussion on point of view (POV) and will also serve as part one of a discussion on Motivation/Reaction Units (MRU). Report only what the focal character sees, hears, feels, smells, tastes, or thinks without using narrator phrases to introduce the sensations. Avoid describing anything that the focal character cannot perceive or would not notice. Dive deeply into the character’s mind to explore his or her thoughts and emotions. Employ motivation/reaction units to make the action flow with a real-time feel. Today I will begin a discussion of item #4, Motivation/Reaction Units (MRUs). 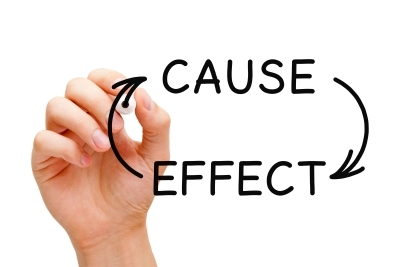 These units are cause-and-effect sequences in a story that show a cycle of cause (motivation), then effect (reaction), which becomes the cause for the next effect and so on. The foundation of this technique is simple – every action, word, or thought that you write for a point-of-view character should be motivated, that is, the reader has a good idea why the character did something, said something, or thought something. Since readers are supposed to be inside the skin of the character, they should know why the character does anything at the moment the action occurs. Nothing should be hidden. Misty cringed when the dog barked. “Misty cringed” is the action (or reaction). The dog barking is the motivation for her action. Since the dog barking was the motivation (and occurred first), it should be reported first. Why? Because when readers see “Misty cringed,” for a moment they don’t know why she cringed. If they are inside her skin (as they should be), they would know why. So for that moment they are blinded to the reason for her action, and they lose intimacy. Incorrect: He arched his back and cried for mercy as electricity shot through his chip, running up and down his spine. Correct: Electricity shot through his chip, running up and down his spine. He arched his back and cried for mercy. Incorrect: His head cracked on the floor once more as another jolt shook him, and blackness overcame all his senses. Correct: As another jolt shook him, his head cracked on the floor once more, and blackness overcame all his senses. When characters react to motivations, their reactions are usually one or more of the following: An involuntary action, a voluntary action, or speech (spoken or interior). Sometimes a character will react in only one of these ways, sometimes two, and sometimes all three. Whenever a character reacts in more than one of these ways, the most natural sequential order is as listed. Involuntary action usually precedes voluntary action or speech, and voluntary action usually precedes speech. Misty reacted first with shaking legs (involuntary), then by ducking behind a tree (voluntary), then by crying out. This order of reactions doesn’t always hold true, but it is the most natural progression, and it will feel right to readers. When a character is faced with danger, involuntary reactions can include cringing, ducking out of the way, striking with a fist, or even shouting (though usually not with words)–anything that a character would do without consciously thinking about it. These are knee-jerk reactions. Voluntary reactions include hiding in the cellar, loading a gun, searching for an escape route, or anything that requires conscious thought. And, of course, reactions differ greatly depending on the kind of stimuli that come about. For characters who are not the POV character, readers will often not know what motivates them, because readers are not inside them, but readers should always understand, without exception, why the POV character does anything, even if the reason appears to be foolish or ill-advised (in the readers’ minds). Next week, I will discuss how this motivation/reaction sequence works in a longer sequence and more about why they are called units. Do you have any questions about this topic? Are you having problems with point of view or showing motivations? Please post your questions or even a writing sample, and I will try to help you out. What about books that tell the POV characters actions and don’t explain why until the big reveal? Or they don’t tell exactly what the POV character did until the big reveal. I’ve noticed it mostly near the end of books, which makes sense for excitement, but what about when it’s done throughout the whole book? I have seen this as well. If writers do this, they are no longer using intimate POV. I don’t like it. I think it’s a cheap way to get a surprise, and all intimacy is lost.